We're back with part 2 of the Dakota trip. Click here if you missed part 1 . Five miles later with no campground in sight Req and I turned around. We returned to the main highway and decided to go for Campground Option II, which was just south of town. As we rolled on the throttle I glanced down at my odometer. Gas. It was something that Req would need in the morning and from what I could tell by the countryside I had seen thus far, once we left Red Lodge we would also leave behind all chances of fueling up. I pulled over once again and explained my concern to Req. We finally decided to go back to the second motel we had inquired at and just take the room. It was getting later, darker and cooler. The prospect of finding gas, and then another campground, the corresponding site and then setting up camp in the dark was not appealing to either of us. We went back into town and rented their last room. It was still light enough to walk along Broadway, but the band had gone home and most of the crowds had retired inside the various restaurants and pubs. Cruisers still lined the curbs and just made the Moto Guzzi Norge parked down the block stick out that much more. What was a Moto Guzzi doing here? We walked by it and saw Washington plates. No other discerning features would tell us who the rider was or where he was from. We wondered if he was an STNer on his way to Custer. No way to confirm our thoughts, we continued walking, window shopping and people watching as we went. On our return down the other side of the street I saw the owner of the Norge putting on his helmet as he sat on the bike. Ever the shy one, I crossed the street to find out who it was. As I approached him he glanced up. A moment's look of hesitation crossed his face before his eyes lit up. He looked familiar to me as well, but I couldn't place his face. Fortunately he wasn't as addle-minded as I am and he remembered my name. He turned out to be Dave, a guy I met at a Washington State BMW campout last August in Yakima. He was on his way to a Moto Guzzi rally in Eureka Springs, Alaska from Seattle. The three of us marveled at the odds of finding another Seattle resident so many miles from home and for different reasons. We chatted there on the sidewalk for quite some time before Dave said that he had to get back to his campsite at the KOA just up the road (something that Req and I conveniently hadn't known about during our search for a place to camp). Req and I returned to our room to eat our dinner and, to our surprise, find that the room came equipped with an "in-shower steam room." All one had to do was set the timer, step into the shower stall, close the doors and within minutes scalding hot steam was piped into the stall. A stool was provided for the user so as to fully relax in the soothing heat. Each of us tried it out and while I don't like steam rooms I must admit that it did feel good. The next morning we got up exceptionally early (6 a.m., much to Req's dismay) and looked for gas and our morning grocery run. Req likes a nice little pastry and a cup of coffee in the morning and it was always fun to see what we could find at our various stopovers. Red Lodge hadn't shown us where it hid the local commercial establishments but true to form of most tourist towns, one block off the main drag showed us a wealth of useful businesses. The Beartooth Market got us what we needed and then a quick stop at the gas station got the bikes what they needed. Now we were ready for Beartooth Pass! I don't think more than 15 minutes of pleasant, winding roads passed under my wheels before the road suddenly doubled back on itself, gaining elevation at a startling rate. Turn after turn negotiated up the steep side of the mountains. Last year's repairs to devastating washouts were evident but the road surface was in good shape. Fields of rocks were poised above the road, appearing ready to crash down with the slightest provocation. The trees retreated from the scene, leaving the rocks unencumbered should they slide but also allowing for vast vistas. Snow packs dotted the shaded gullies and the bright sun lit up the dry road. There was only one other car headed in our direction and we were able to move around it easily, using the long sightlines between switchbacks. A DOT sign made me smile: "Stay on Road." I thought the instruction was a little redundant, but I guess some people need to be reminded. We pulled off at a vista point, where I figured that we had crested the pass and it would be downhill from here. As it was, the views were stunning. Towering peaks still covered in a mantle of snow reflected back the brilliant sunlight, giving a stark contrast to the dark and somber tree-covered slopes below. A wide glacial valley was stretched out before me, the narrow pavement snaking its way up one side, while the other side of the valley was marred only by a single dirt track. Naturally I wondered how to get to that track and where it led. That would have to wait for another time. Today I had a date with Custer, SD and I didn't want to be late. After getting back on the bike I was somewhat surprised at the rate at which the road continued to climb. Not the tortured switchbacks of previous turns, but still tight corners that led to more and more extravagant scenes. 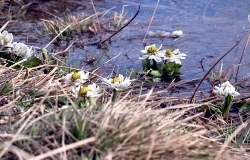 Then the trees vanished completely and we were left with vast tundra, dotted with snow and pockets of melted ice water. A sign welcomed us to Wyoming and tall sticks placed by the DOT indicated snow levels but sparse remnants existed of those packs. There was nothing but distant mountain ranges to hamper the view in all directions. Small delicate flowers blossomed staunchly in the glow of the sun, braving the cold wind in this short growing season. Puddles of melt water reflected back the blue sky, giving off the illusion of warmth despite the thin skin of ice still coating the surface. A steady breeze blew across the land but there was little movement to give evidence of its presence. Finally I was at the top of the pass, where the GPS read 10,947' above sea level. And now it was time to go down. It took a long time to travel across the tundra at the top. I was certain that it would be just another corner and the road would angle down but instead it kept close to its current elevation and snaked along low ridgelines. Then the corners got sharper and the snow pack deeper. 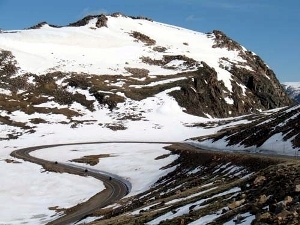 The road dropped down and the views were of icy lakes, stunted trees and rocky outcroppings. It was right out of a fairy tale. Traffic increased slightly as we encountered those travelers who had started in Wyoming and were just now getting to the pass. Motorcycles dominated the crowd, if a dozen vehicles can be considered a "crowd," and the road was still unencumbered we descended into a more hospitable-looking environment. Streams rushed along valley floors and trees regained their height. Soon the snow had disappeared and a young buck in velvet bounded into the forest as we rode by, continuing our descent to a warmer climate. A quick junction onto 296 led us east over Chief Joseph Pass and into Cody, Wyoming. The temperatures had become comfortable again and the sun was shining above me. The road was nestled in a pine-filled valley and oozed comfortably along the southern wall. High rock outcroppings lent a touch of color to the otherwise green views and a few miles of grey tree trunks gave evidence of raging wildfires that had torn through the land years ago. As we neared Chief Joseph Pass, there were small signs of ranching in the area but it was minimal and we had the countryside to ourselves. A deep fracture in the earth heralded the start of the pass and there were many people pulled over to gaze into the crevice's depths. I passed by them all, more interested in surmounting the height of the mountains in front of me. The road was in excellent repair and was nicely cambered and apexed through the corners. Fortunately there was no traffic in front of me to slow me down and I was able to fully enjoy each turn as it presented itself to me. I felt sorry for the motorcyclists I saw coming down the pass who were not just stuck behind a slow moving semi, but one carrying a load of cattle. What a stench it exuded! This was a much quicker pass than Beartooth with slightly less expansive views. But there was a nice pull off near the top that gave a rich history of the area and the plight of Chief Joseph and his people. After reading the historical plaques and taking some pictures we headed down the other side and into Cody. As we descended, the temperature rose and by the time we crawled through the main streets of Cody it was time for a break. A brief stop at a gas station on the way out of town allowed us to adjust our gear choice, get some fresh water and check out the map for our next destination. 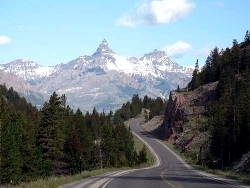 You can't go wrong with the east-west routes across northern Wyoming. 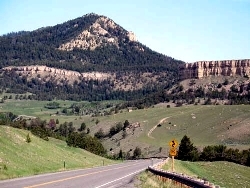 They all go over the Big Horn Mountains and it's just a matter of what kind of road and scenery you want along the way. For this journey we had decided to cross over on 14, mostly because I hadn't been on it before and Req figured that I should see something new on this ride. I guess the fact that Koocanusa Lake, Beartooth Pass and Chief Joseph Pass were all new to me didn't seem to count. But first we had to get to the Big Horn Mountains. This entailed running across central Wyoming, which, like central Washington, is hot, flat and rather dull. So run we did, getting into the town of Greybull as quickly as we could and just in time for lunch. I found an inconspicuous dinner in downtown Greybull and while the food was ok, I was disgusted by the many patrons who insisted on lighting up during and after their meals. I had never been more thankful for Seattle's public smoking ban. I was ready to leave before we even ordered, but I kept hoping that the old couple would leave before my food was served. They left shortly afterwards but were replaced by three other patrons who immediately lit up upon being seated. Fortunately lunch didn't take long and Req and I left as soon as we could. Dessert was waiting for us in the guise of deep pink canyons, rushing streams and twisting pavement: the Big Horn Mountains. There's no real way to describe the joy of a perfect corner: the pavement tilted at just the right angle, the radius even around its entire length, the surface smooth and clean. It's a joy that is sought after and savored as often as possible and I savored this road into the Big Horns. Corner after corner, with a periodic pause in between to allow full appreciation for the natural beauty that formed the backdrop, led me on a merry chase to the top of the mountains. And after the steep ascent I was greeted with open fields of lush grasses and thick stands of pine trees. Marshes dotted the landscape and while the views weren't very expansive, they did provide a nice alternative to the hard rocky walls of the canyon I had just climbed. The road took a sharp turn to the north before eventually meeting up with 14A. The joined roads swung back to the east and incredible views were to be had as the road took a dramatic plunge to the flatlands of the northeastern corner of Wyoming. The serpentine road raced down the side of the mountains, almost desperate in its need to find flat land. The pink rocks of ancient corals contrasted beautifully with white shale and green forest. It was a symphony of colors, the bike dancing its way through corner after corner. One hundred and forty-six miles of hell lay before me, alternately known as "I-90." As I mentioned earlier, I had a deadline to meet in Custer and needed to be there by 4 p.m. This left me no time to explore alternate routes across eastern Wyoming, not that there is much of an alternative. Req chose to follow me and together we trudged across the open landscape of rolling hills, low clouds and strong winds. This left me plenty of time to consider what is so very "wrong" with interstates. Sure, they are perfect for moving California strawberries to my local market before I would normally even consider the prospect of strawberry pie, but for vacation travel interstates should be shunned. But why are interstates such soul-sucking entities? I can only come up with this hypothesis: they are highly sanitized roadways. The government has made them predictably safe with wide corridors, drawn-out corners and expansive shoulders. In doing all of this they have also removed the traveler from his surroundings. No longer does the grass come right up to the edge of the pavement, patient cows mere feet beyond a wooden fence. No more sharp bends in the road hiding the surprise of what might lay around the corner. No more small towns to navigate that offer an insight to its peoples and a different way of life. No, none of this can be experienced on an interstate. Instead, for thousands of miles the same food and motel chains confront the traveler. The rate of travel never changes no matter how many hills have been vanquished or subdued. Towns are obstacles to be bypassed as quickly as possible and with the least amount of interruption. The interstates do not allow a traveler to fully explore the land but instead he is treated to the Disney-fied version of America, and I find this to be a crime in and of itself. A brief break in Gillette allowed Req and I to reclaim our souls before they could be completely diminished. Thirty minutes more was all that lay between our exit and us. Rain threatened constantly but never fully expressed itself, although the pavement was frequently damp as we passed. I was feeling excited as we neared the Moorcroft exit, knowing that from there is would be straight but at least two lane roads for the next hour to the South Dakota border. And once we crossed the border � thirty more miles of unsanitized roadway for my pleasure. Sure enough, as soon as I rounded that perfect radius exit from the freeway my soul began to sing again. Or maybe that was just me in my helmet. Regardless, I woke up and started to take notice of the things around me: the rusty railcars, the swaying grasses, the dilapidated barns with rotting bales of hay stacked in the fields. I was alive again. Req and I pulled into the resort in Custer with time to spare. We found our cabin, our cabin mate and unloaded the bikes. I wouldn't have to load things up for two days so I stripped the bike down in preparation for a casual "local" ride the next day. Now the rest of the evening was mine to enjoy with friends, both old and new. 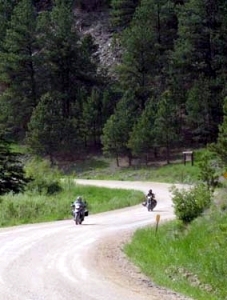 Having ridden through this corner of South Dakota a couple of times before I had little desire to re-visit the roads and sites previously enjoyed. This year I was prepared to see the so-called "backyard" of the Black Hills. I mentioned my plan to take dirt roads into Deadwood and by the end of the evening I had four other willing souls to join me. A late start was planned, as it was to be a late night. The morning dawned bright and cheerful and I eventually roused myself from my bed. I meandered around the resort for an hour or so, chatting with other riders and checking out their bikes. Ten o'clock came and it was time to depart for our little adventure. Because it was my idea to go to Deadwood, it was also my responsibility to lead everyone there. Fortunately for me no one else had a map so they wouldn't know when I missed a turn or really had no idea where I was. The roads we found were well-maintained gravel roads that looped through pastures and forests alike, crossing over cattle guards guarded by fat cattle and their calves. The pace was easy and relaxed with plenty of stops for photos (to disguise my map checking needs). Recent rains kept the dust to a minimum, which was an unexpected blessing, as the five riders were able to keep fairly close together. Bear Mountain lookout was on my map and we took the 3-mile detour to check out the structure and its views. I confess that the Black Hills aren't that impressive from 7,000' but it was still a welcome addition to the backyard tour. A few miles of pavement appeared before we found some more gravel, only to be regulated to pavement for the final miles to Deadwood. Deadwood was a disappointment to me. I realize that I was spoiled by the rough beauty portrayed by the HBO special I had watched over the winter, but in no way was I prepared for the shallow tourist trap that the town appeared to be. To be fair, I spent very little time really exploring the town and its history. I didn't walk beyond the main street, nor out to the cemetery, nor enter many of the buildings. But what I did see were buildings with beautiful facades that contained obnoxious slot machines in the front and over-decorated restaurants in the back. Tour buses, cars and motorcycles clogged the streets and gawking people crowded the sidewalks. Our group finally found a relatively quite place for lunch and enjoyed a social hour around the table while eating our food. The temperature was hot in town and it was a pleasure to enjoy the respite of the back room. After lunch we took a brief stroll down to the end of the main street and then back to the parking garage where we had left our bikes. It was the general consensus that we'd rather be on the bikes then here and it didn't take us too long to gear up and "get out of Dodge." Once again consulting the cheesy map handed out by the front desk of the resort, I selected an alternative way back to Custer, inadvertently taking us six miles out of our way instead of the more direct two mile route to the main road. Once on 385 south I checked the map frequently, trying to determine when I was approaching the squiggle on my map as I passed each recognizable feature. I missed the turn. I knew I had gone past it when I saw the sign for the lake. I considered continuing south and merely taking the next turn off but the previous route had us skirting a river and as every motorcyclist knows: a road that follows a river is a Good Road. I pulled over to the shoulder and let everyone we were going to turn back. No one seemed to mind and in fact, once we had taken the road in question it was generally agreed upon that it was a worthy quest. The river road was superb and vastly more enjoyable than the morning's selections of roads. Tighter corners, more elevation changes and the close, lush scenery of the river all combined to create a wonderful backdrop to our little trip. What more could one need for a quick adventure? Why, how about the US Army? The Reserves were apparently practicing this weekend as there were tanks, trucks and Humvees all over the roads, both paved and otherwise. However we were surprised when we rounded a bend in the road and saw a sign proclaiming "Military Block Ahead � Slow Down NOW!" And there around the next bend were tanks, Blackhawk helicopters, razor wire and machine-gun-toting men in fatigues, all camped out in a field on the side of the road. The guardsmen were manning the access road to this field, guns at the ready and pointing towards us. To say it was unnerving is a bit of an understatement. But we were just passing by and nothing more came of it. Until later in the day. I had stopped at a "T" junction to consult my map � I mean, "take pictures" - when I saw five Humvees coming our way. Always polite, they had their turn signals on, indicating that they intended to go in the same direction as we did. Not wanting to get stuck behind a convoy of sluggish army guys I encouraged everyone to hurry up and take off up the hill. The hill was steep and the road twisted sharply up its sides. I kept up a decent pace but still made sure that there was a headlight or two behind me. The last member of the group, Trina, later told me that Humvees are not slow vehicles and it was all she could do to stay ahead of them. I can only imagine what it would be like to be riding down a dirt road with the Army in my mirrors - I thought that State Troopers were bad enough. We eventually lost the Army and found the pavement. It was time to head back to the resort for one last night of carousing and socializing. It had been a fun day of exploration but tomorrow would be another day of riding, this time toward home. I packed up my bike the next morning under another clear blue sky. It would be a good day to travel. Jim, who had ridden with me the previous day, asked if he might ride with Req and I to Devil's Tower, our first planned stop of our return trip. The three of us headed back toward Deadwood but this time skirting around the west and into the clutches of Spearfish Canyon. There are only twelve miles to the canyon, all of them grossly under marked with ridiculously low speed limits. But those twelve miles are full of curves that just don't quit. From the left to the right, the bike was constantly in a state of side-to-side movement, racing the clear waters of the Spearfish River. Traffic was remarkably light, due in part to it being mid-morning on Thursday, and I was hoping that no one coming the other way would tag me for exploring the limits of my sidewalls. At the end of Spearfish was the dreaded interstate. Less than half an hour of it, but it was unanimous that that was 29 minutes too much. 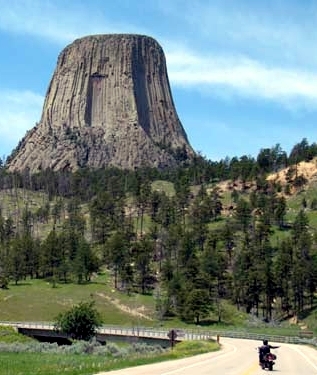 Fortunately the last thirty miles to Devil's Tower were along blessed two lane roads and more intimate surroundings. The sky, while bright, had a slight haze in the distance. Therefore it was some time before I was able to get my first glimpse of the iconic monument that rises so abruptly and unusually from the ground. But once I saw it, it was hard not to keep my eyes off of it. I had been to this monument once before, four years ago, but it was still amazing to comprehend the incredible natural forces that created this edifice. Part 3 coming in December!